At one of my first repositories  I visited on my 6 week Midwest trip this summer, I realized I had not really thought about how I should record the findings or lack thereof. Realizing I would visit a large number of repositories, I stopped and gave it some thought. Here is how I took notes and gathered documents from courthouses, libraries, archives and other repositories. I record my findings in a Word document. For my Midwestern research trip just completed, I created a separate documents for each geographic area where I researched: northern Iowa, southern Iowa and Illinois. Each document became a journal of my journey. At the top of the page, I titled the document with the name of the region and then I listed the repository and office name, if appropriate, and location, e.g. Hancock County Courthouse, Clerk of the Court, Garner, Iowa. This is in bold and dated. It also might include names of individuals who were particularly helpful along the way. I then typed what I was looking for (e.g. deeds from 1895-1954) and the name of the person(s) of interest. This exercise formulated the research question for that particular repository and forced me to focus on the individuals who I might find in that particular repository. It also served as a reminder if I went off topic to do some “bright shiny object” research! All this could be done in advance. Early in my journey, I mostly looked for deeds and I found many. For deeds, I recorded the grantee, grantor, the date of filing, the volume and page number and sometimes the locational information from the index entry. I did this for all the dates of interest for each of the person(s) of interest. Then, I gathered the deeds themselves. Most of the courthouses I visited preferred me taking a photo rather than making a photocopy. A photocopy bends the bindings too much on fragile documents and a photograph can be taken in place and takes no staff time– or paper and ink. That was not true in Illinois courthouses where I could not even take my computer or phone/camera into the building. If I took a photo, I always asked if they wanted me to pay them for the number of photos taken as if I had made a photocopy. Two courthouses willingly took my money. Most did not want to be bothered, but I think they appreciated my asking. But, back to the recording…. Once I found the deed based on the information I had obtained from the index, I would copy it or take a photo,. I then changed the color of the index entry to green. If I didn’t find it (rare), I changed it to red. It stayed in black type if I decided not to pull it. I didn’t pull all the deeds I identified. Certainly if there were any anomalies to the deed or it’s recording, I would expand my notes. For each document type, I made sure I had all the information necessary for a citation by taking a “stab” at writing it up. Then I made sure I captured all the necessary info in the photo for each unique deed. In Iowa, the county courthouse is the repository for many of the documents genealogists seek. It was usually my first stop. The Recorder holds the deeds and the vital records. The Clerk of the Court holds the naturalizations, probate records and court filings. Sometimes the office does not have the record but the records has instead been moved to a historical society, genealogical society or even in one case, to a person’s home to be indexed. I make a note of that and the contact information. I record positive and negative findings. I would create a separate Word doc for each repository and if a courthouse, for each office of the court. I would be as diligent about recording negative findings as I was at the end of my trip at the beginning. I would note if I took a photo of a particular document. I generally did an online catalog search the night before visiting, but I still made some rookie mistakes such as trying to take my computer into the IL courthouse or arriving 30 minutes before they opened. I would do more organizing of the past day’s findings at night–but I admit, I was exhausted! I hope these experiences help you. Perhaps you have some recommendations to share with me? I would love to hear them. Just make a comment in the comment section. You also might like to hear about how historians record their findings. Check out this episode of Ben Franklin’s World, hosted by Liz Covart, one of my favorite podcasts which I listened to while driving. I was happy to hear that of all the many systems discussed, a Word document seemed to be the best for Liz and her expert guest. What I have done since the last post: yoga, cleaned out the car and getting charged up to work on my KDP tomorrow. Hardin County (Eldora, IA) Courthouse, 2016; photograph taken 9 August 2016 and privately held by Jill Morelli, Seattle, WA. Ms. Morelli took the photograph on her genealogy research trip to the Midwest in July-September 2016. Are there more writing “incentives” learned from Kempthorne? Yes!! Since my previous post was way past the recommended blog limit for number of words, this one will be mercifully short. 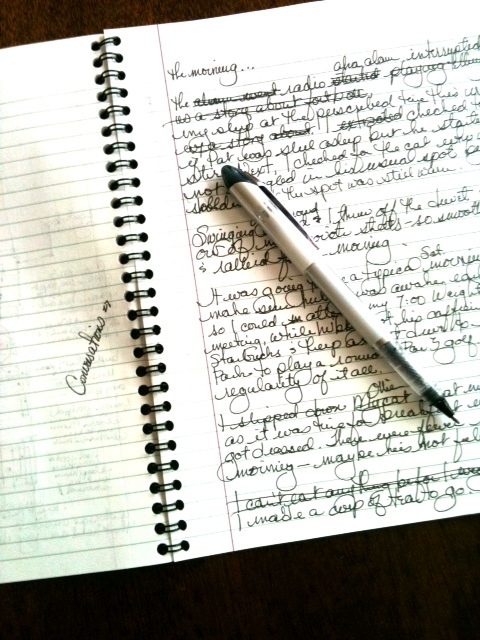 Here are a few ideas to get you regularly writing…. 1. Make a list of stories you have told anyone more than once…the camping trip on the Glover comes to mind for me…this list should include at least 10 ideas for stories. 2. Take one of those ideas and write about it. 3. Write about your day or a portion of your day…not just the facts, but add conversation, what you smelled, what you saw, what you felt. I wrote about my morning which was very routine but I got 350 words in about 7 minutes. 4. Do the childhood home plan idea which I illustrated in the previous post. 5. Write about one of your annotations to the plan. 6. Write a family story in an email, attach a photo and send it to your kids or grandkids. Charley actually sends an email about his family history to one of his six kids daily. On the 7th day he sends a similar email to all his grandchildren. 7. Set a goal of 500 words a day. And write at least 500 words; never less. Doesn’t matter if it is good or horrible…just write. No writer’s block allowed. 500 words written badly is infinitely better than 0 words written exquisitely. 8. If you write 500 words a day, you will have 182,000 words at the end of a year, the equivalent of 3 books! Pretty cool, huh? I am a believer in regularly writing but I am no saint. I do not write about myself or even much about my family. Should do more. Part 3: How do you incorporate your data from the computer to the papers you write? The only right answer is “It depends!” For me, it depends on what I am writing and who is my audience. I used to think that making good genealogy reports was only a function of the computer program I bought. I now think differently. I had always believed (and still do) that the computer program is for storing evidence about my ancestors and their descendants. This evidence is the result of the compilation of information that has been analyzed by me and connections/relationships have been identified and recorded. I used to believe that if I just worked the information cleanly enough then I could “punch a button” and out would come a really good report I could use in all situations. I was wrong. The information is sterile; the stories are repetitive….this doesn’t make them bad, but they are just not acceptable in all situations such as the books I write or for the requirements of certification. I also admit that my requirements have changed over time; I never started doing genealogy because I wanted to write the family book or get certified! I am now careful about when I use what is “canned” in the computer. This is what I do: while I gather the data I try to think of the good “stories” that each person could tell. Is there anything unusual, such as a very young or old person getting married? …a solo emigration at a young age? …anything odd about the timing of children (my grandfather was a “1 day baby”….his parents married the day before he was born! It was a miracle!)? Or, did they work outside the parish frequently? Did their parents die when they were young? All events tell you something about their lives. Because I am an architect, I also think that our physical environment shapes us, so I ask questions about the land and how it might have influenced decision making. Lacking our ancestors direct communication, we have only our own analytical abilities to rely upon. These questions can sometimes be answered by looking very closely at the “public” information provided. 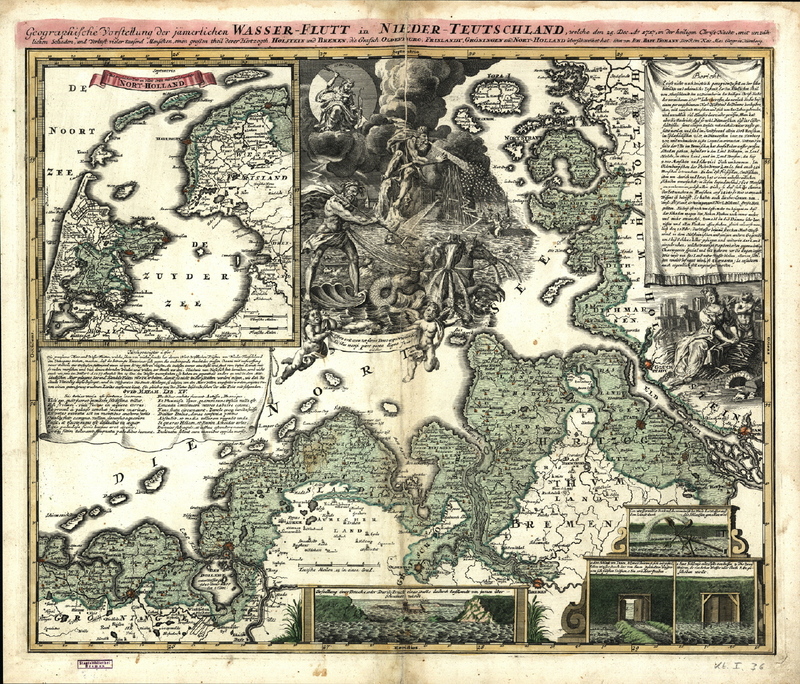 the Christmas Day Flood in 1717 struck the entire North Sea coast of Holland, Denmark and Germany and affected all families living in it’s path. Also in 1719, to pay for the improvements to the Ostfriesen dike, the officials conducted a tax census and counted households. All my mother’s ancestors were within the flood zone. In my computer program, I can create a tag that allows me to link people to the flood and tax census events. But, the repetitiveness of that story for each person is mind numbing and implies that each had the same experience. If you look closely at the map, one can see that those closer to the dike break had a different experience than those further away and others ended up with a ship in their backyard! It’s a great story and it’s all on the map or in the census! If I were to use just the computer program’s suggested language it would tell the same story for all but not a true story. When I wrote books on two of my immigrant families, Bengt Peter Anderson and Ryke Rykena and their families (http://www.lulu.com). I quickly found that I was using the information stored in the database but very little of it was “canned” from the computer, the notable exceptions were the pedigree charts and family group sheets at the end. Of course, I could have written it differently, but I wanted the books to be for a family audience not the NGS, BCG and not even other genealogists. I also knew that the more graphic rather than narrative information I could include, the better the book. This approach would not be suitable for the types of reports needed for BCG. For certification, the format of these reports is so prescribed, it takes me less time to rewrite then it does to use the “canned” report and modify. (I admit that because of my internal set up with my MAC, the latter is not even a possibility.) The writing style is better if “fresh,” rather than relying on the repetitiveness of a computer. What I have done since the last post: Added 500 words to the Dahle lineage report and have the narrative completed. Now to start the footnoting. Worked on my class assignment for the Bibliography. We have to find 15 different sources and annotate them. I have all but 3 or 4. All relate to Dahle’s Civil War service and his stint in the hospitals of Washington DC. Also found some very interesting photos. Part 2: What is your physical set up for working back and forth between the data and the narrative? I have a double screen set up. I cannot imagine doing this without that duality. On the left side I have my genealogy program always “live” and on the right side, I have the browser open. I use FireFox, but I am not sure it isn’t because it’s got a cute logo. The browser has the following tabs open as I write this: familysearch.org, 1801 census for Norway from DigitalArkivet, the 1875 census for Norway, findagrave, David Rumsey historical maps, Pottery Barn and ancestry.com…and, of course, WordPress for this blog. I have had more open at a time but that is what I have right now. I work on a MAC so I the option of 4 complete set ups. What I have described with software/browser is one. The other set up is my e-mails and the third has the documents that I am working on such as the lineage report for Jens, the bibliography for class and/or the chronology. Sometimes if I really get to multitasking, I have the materials for the conference I am chairing in 2012 open also, but not often. I don’t generally use the fourth. I will often move the document I am actively working to the primary set up of the data and internet. That way I can click between people and record the data right from my software program, The Master Genealogist or TMG. I also have my reference materials at hand. We have to use Chicago Manual of Style for footnotes for the class and I use Evidence! for the certification reports. These are just to the right of the keyboard. Do you do something similar or different? What I have done since the last post: made Halloween cookies and gone to the UW football game which we won but now I am hoarse. Also started reading, Civil War Nurse, the Diary and Letters of Hannah Ropes. Hannah worked in the DC hospitals during the Civil War until she too contracted typhoid pneumonia and died in 1863. She would have been in the hospitals at the same time as Jens but she was in Georgetown. Part 1: How do you keep track of information that does not yet rise to a level of “proof”? I thought it might be interesting to you to hear how i work with my data and the sequence of thought. When I do the data gathering, I am continuously entering information into my database; I do not hold information for later entry. In my personal research I trace all children, their spouses and their children. If we have a gene in common, I will work the line. That theory means I do not trace ancestors of people who marry into the family, but I do trace descendants. Since I have 11K people in my database using the above theory, I am going to stick with it. I am not interested in “people collecting” as some are. I use my software program to handle “work in progress”, particularly if I am faced with indirect evidence that is just not conclusive. I will gather snippets of information and enter it into the database. Some examples are: people I think might be related but I need more evidence; people who I think are mine that show up in the US and I didn’t think they immigrated etc. etc. To keep these types of investigations clear and in front of me when I want them to be, I use a tag system based on scientific inquiry. I have tags for “Research Hypothesis”, “Research Notes”, “Research Conclusion” and “Research Records Not Found”. I use the Hypothesis tag if I can imagine a scenario but I just do not have time to do any investigation. I change the Hypothesis tag to Research Notes and enter what I have done, if I do any work on it and I have not come to a conclusion. As soon as I have a conclusion….either yes, I hypothesized correctly or no, I didn’t, I change the tag to Research Conclusion and enter my proof. I keep this tag. Research Record not Found will continue be used when, for example, I cannot find them in the census after going through the pages the old fashioned way. That way I do not go looking for it again. This system has really worked for me. What system to you use to keep track of work in progress but suspended, or conclusions reached? what I have done since the last post: Progress! I have written 2500 words on the Jens T. Dahle lineage. I decided the footnote process was getting in the way of a smooth narrative. So I am writing, based on the information I have. I will then go back and add footnotes or change what I have written to align with the information I have. I also got a great book “Civil War Nurse: The Diary and Letters of Hannah Ropes”. this woman was a true ground breaker in the hospitals of the Civil War and died for her endeavors in 1863. This might form a backbone of my class project. I’ll keep you informed.